We are the leading manufacturer of Snooker Table. Size 12'0" X 6'.0" Ht. 34.5"
Size :- 12'.0" X 6'.0" X Ht. 34.5"
8 Round Legs( 6"x 6") with Nuts and adjuster for leveling. Six Imported Inner pockets of International Size. 6 pcs of Billiard Cue tips. We are one of the most eminent names of the market engaged in offering genuine quality Royal Snooker Table to the customers. These products are made by a team of highly skilled & experienced experts. The tables are covered by superior wool cloth like a caress. Moreover, we follow the exact measurements detailed by the sports authority while designing these products. 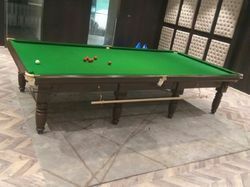 We have gained expertise in offering a best-in-class range of Snooker Billiard Table to the customers in different specifications, by the assistance of our team of experts. These tables are designed in compliance with the international quality standards. In addition to this, we make use of high quality basic material to manufacture the Snooker Billiard Tables. Portable Snooker Table manufactured by us are provided to the clients in varied sizes and capacities to meet their variegated demands. Fine quality wood and veneer sourced from trusted vendors are used in the manufacturing process of these billiard tables. Clients can avail these billiard tables from us in different colors, sizes and other specifications. 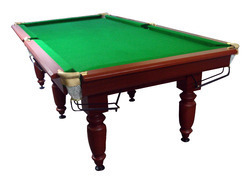 We have on offer for our customers a quality-tested range of professional Antique Snooker Table that are manufactured using finest raw material. Carefully selected hardwood is used for making the frame, body and cushions. 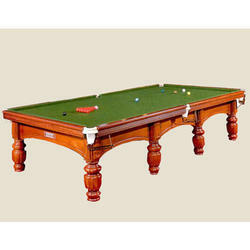 Snooker tables are made available to the clients in different sizes and colors. Our large production capacity makes us capable of fulfilling bulk as well as urgent demands of these billiard tables.